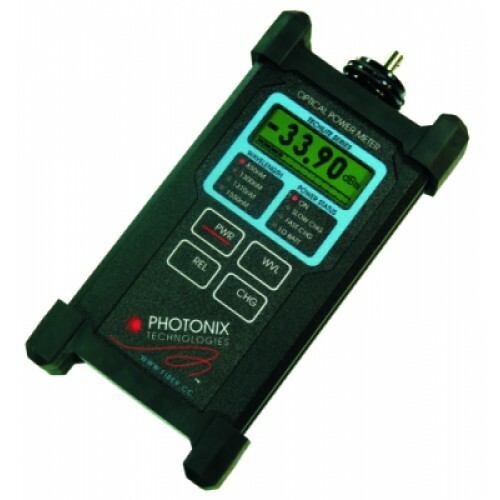 The TECHLITE™ series of optical power meters was designed to provide the test technician with an inexpensive, accurate, and easy to use instrument for making power and loss measurements in the LAN environment. TECHLITE™ meters are NIST traceable, calibrated test instruments featuring a dynamic range. TECHLITE™ meters also have distinct advantages over expensive add-on fiber modules. TECHLITE™ meters do not require a docking unit or mainframe to provide intelligence. This unit comes with standard ST ports, this meter fit comfortably in most multi mode LAN environments. A low battery indicator is included to ensure accurate measurements. The oversized, high contrast display is updated over 5 times per second and features nearly instantaneous settling time! Regarding durability, the TECHLITE™ meters are built of machined aluminum, not plastic, and therefore have structural integrity and a feel superior to that of most fiber test equipment. In fact, TECHLITE™ meters may likely be the toughest pocket sized meters on the market.